Sometimes it feels like Sasha is just a large toddler. I say that with the utmost love and affection of course, but out of sheer exhaustion from the constant 'watching'. And running back and forth. And tidying up. I know, I know, you're all thinking I should just do less of that for her, she's too used to it, and it's my own fault. Don't you think I would stop if I could?! Give myself an easier life?! Let me let you into a little secret. I would if I could. Or more to the point, if she would let me. 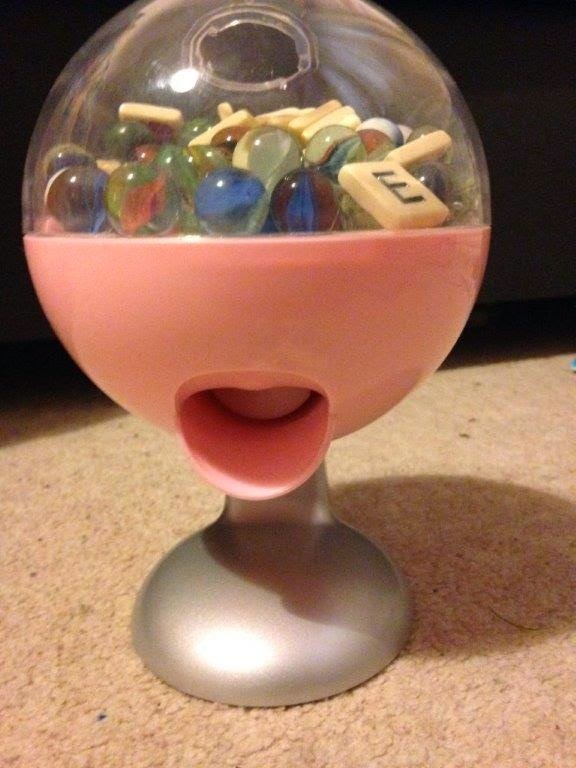 Sasha had asked for one of these sweetie dispensers for her birthday. Until fairly recently she rarely asked for anything in particular, and so I was pleased to oblige; it seemed like a 'fun' thing to get for her. As Mr C and I caught up on yesterday's news in the kitchen, she managed to sneak in behind us and take this dispenser to her playroom. She then proceeded to fill it with marbles and Bananagram letters (google them, they're good!) and was trying to make them pop out via the corkscrew at the bottom which pushes the sweeties out. Sadly though, some of the marbles are slightly larger than others, and so at some point Sasha must have thought it was a good idea to stick her thumb in through the exit point. What happened next was, probably due to accidentally brushing the touch sensor pad (bad idea, manufacturers), her thumb got stuck and crushed. That's just a one-off thing, I hear you say, and plenty of that happens to accident-prone children around the country every day. Yes, I can see your point. Not sure they're all aged seven and still 'exploring' things though? Like putting everything in their mouths, from hair clips and paper to blu-tack and scissors? Yes, scissors. And it doesn't matter how many times you 'tell her off' or reprimand, gently or otherwise (though shouting has the knock-on effect of a major meltdown, so I do try and avoid that on the whole), the message doesn't seem to get through. I can repeat myself like a parrot until I'm blue in the face, but I know it, or something similar, will happen again. Probably the next day, but possibly even later on the same day. Take our sofa for example. This is what happened to it last Friday, when Sasha was off school sick and complained of having sore lips. I took her one of my lip salve sticks - the slightly rose tinted one I keep in my bag. Then I went to make her lunch, and sadly forgot that I had left it with her. Until 3 hours later, when I discovered the empty (totally) casing of my lip salve on the floor in another room. 'Where's my lip salve, Sasha?' I asked. 'Errrr, on the sofa mummy' she replied, with no qualms. 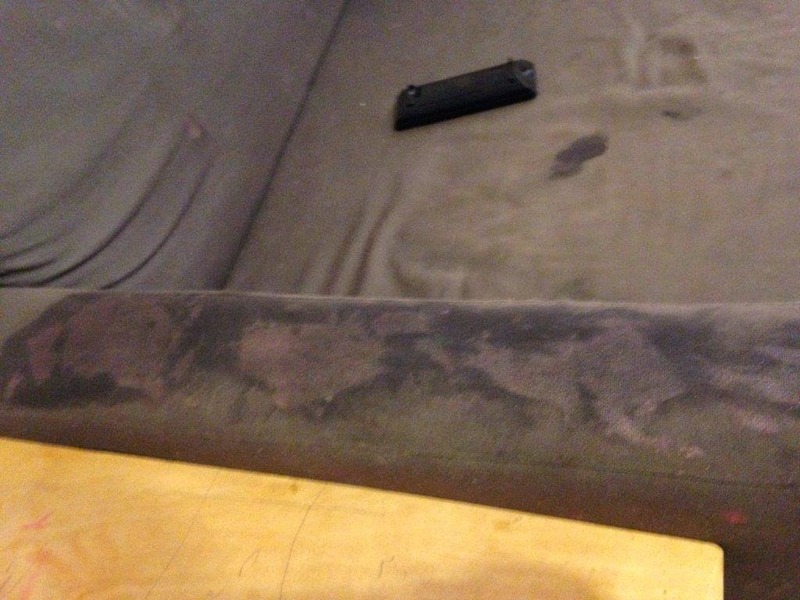 I returned to the room to find the arm of the sofa totally and utterly smeared with said rose-tinted lip salve. Have you ever tried getting that stuff off anything? Not even baby wipes can save you there! Now I know that this is the type of incident you've seen toddlers perform with the Sudocrem. Toddlers though, not seven year olds. It was my mistake of course; I'd let her take the piece of birthday cake away from the kitchen, and I HADN'T WATCHED HER. Silly, really, you think I'd know by now. But then again, I do think it's important to try and get the odd bit of washing up and laundry done from time to time. 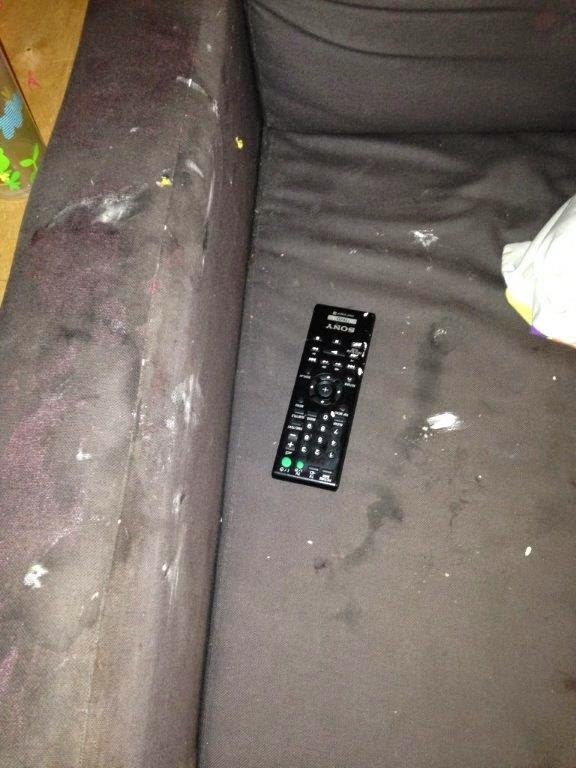 Yes, it's the remote control, full of a secret stash that I had somehow missed. 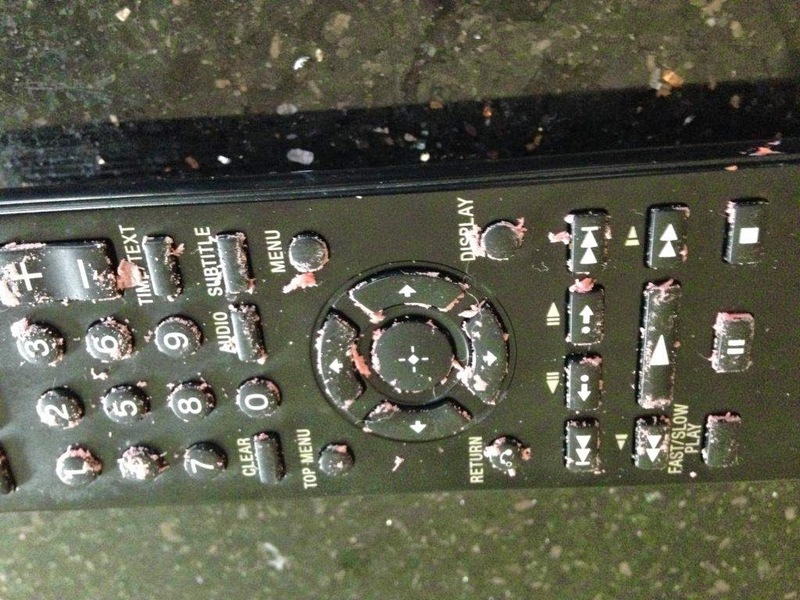 Let's just be clear, the remote was not just 'in the way' and had stuff dropped on it by accident; this was covered on purpose. It's a wonder it still works. Oh I could go on, with photos of walls and carpets that have been drawn on, and items which have been touched a little less than carefully and are now in more pieces than they should be.... but I'm hoping you get the point. Maybe you're a little exhausted just reading this. So if you come to my house, please don't turn your nose up at what a state it's in, whether that's rooms where Sasha has 'been' or just the general housekeeping kind of stuff. Instead, maybe you could offer to watch Sasha for me for just 10 minutes or so, and I could go and rest my head whizz around with a feather duster. I'd appreciate it, honestly. Though I'm not generally one for talking on behalf of the masses, I'm imagining this is a similar story for all parents of children with Special Needs. Maybe, just maybe, they do a little more 'watching' than the average person (the children that is, not the parents). Even if you can't help, please try and understand. My School Days. Brilliant, but Different. School Summer Concert: To Be, or Not To Be? !